Coupling devices are highly recommended for all industrial fieldbus systems, FF or otherwise. Not only do these devices provide a convenient means of forming highly reliable connections between field instruments and the trunk cable, but many of them are equipped with features such as short circuit protection (so that a shorted spur cable or field instrument does not cause the entire segment to stop communicating) and LED indication of spur status. Cables connecting to a coupling device must be equipped with special plugs matching the sockets on the coupler. This presents a bit of a problem when attempting to pull such a cable through electrical conduit: the bulky plug requires either over-sized conduit to accommodate the plug’s width, or requires the plug be installed on the cable after pulling through the conduit. Both approaches are expensive, the first in terms of capital cost and the second in terms of installation labor. For this reason, many installers abandon electrical conduit altogether in favor of ITC (“Instrument Tray Cable”). As evident in this photograph, ITC is obviously rated for continuous exposure to direct sunlight and moisture, as well as a certain amount of physical distress (abrasion, high and low temperatures, etc.). Article 727 of the National Electrical Code (NEC) defines the acceptable uses and installations of ITC. It should be noted that while a properly shielded and grounded FF cable is quite resistant to radio-frequency interference, coupling devices may present “weak spots” where radio interference may find its way onto the segment. Different styles of coupling devices offer differing levels of immunity to RF (Radio Frequency) noise. Those made of metal and properly bonded to ground will be well-shielded, while those made of plastic having exposed connection terminals offer little or no protection. 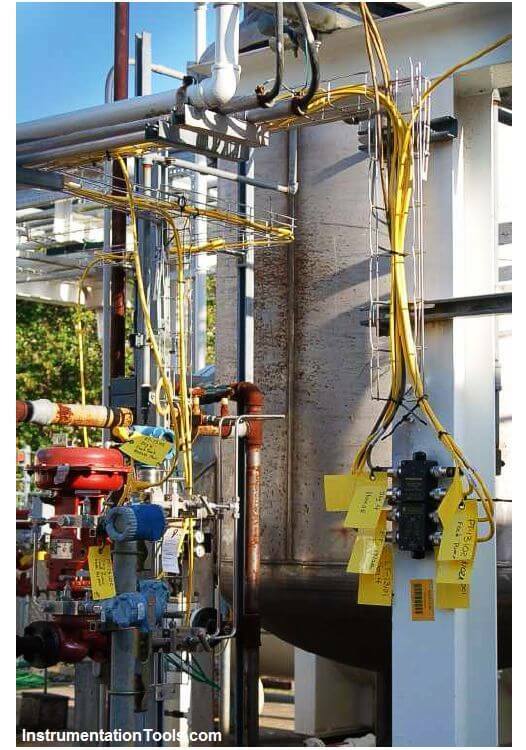 In any case, it is a good practice to avoid “keying” any portable radio transmitter in the near vicinity of a Fieldbus coupling device. 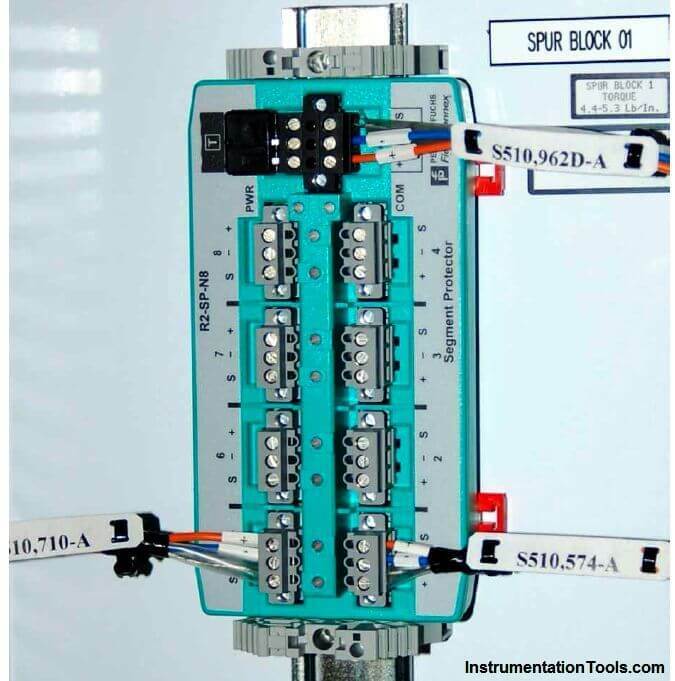 This Fieldbus coupling device is aptly labeled a segment protector, for it not only couples spurs to the main trunk of the Fieldbus segment, but it also guards against short-circuits in the spur cables and devices from interrupting communication on the rest of the segment. If you look closely at the upper-left of the coupling device, you will see a black plastic square with two leads inserted into screw terminals: this is one of two terminating resistors found in this Fieldbus segment, meaning this particular coupling device is at the “end of the line” of the network segment. 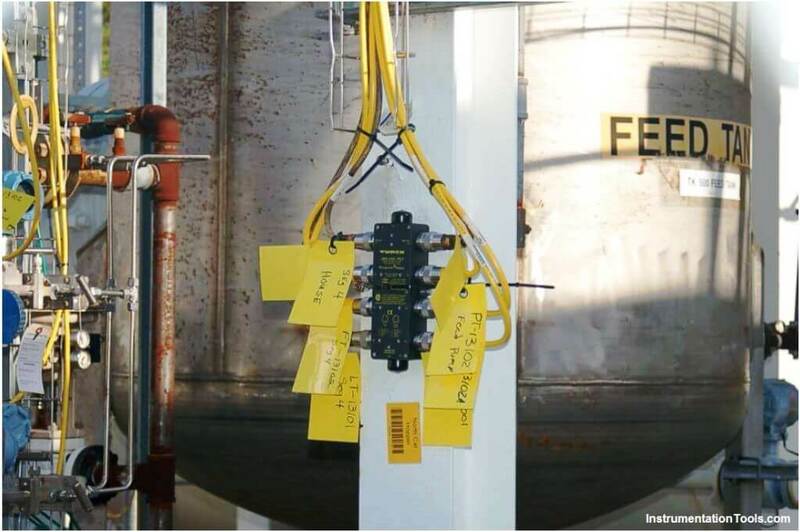 Not only do enclosure-protected coupling devices eliminate the need for special weather-proof connectors and instrument tray cable, but they also enjoy the radio interference immunity granted by being inside a metal cocoon.